Alexandrapol-Leninakan-Gyumri has been a city of songs and music. 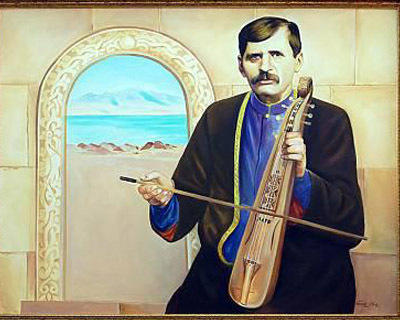 Starting from the middle of the 19th century, most of its bards (gusan) were quite famous in Caucasus. Jivani, Sheram, Igit, Dvali Mukuch and others composed their works here. The combination of different traditions at the beginning of 20th century,led to creation of the compositional art, which was represented by on of the biggest composers and pianist Nikoghayos Tigranyan. The opera “Anush” composed by Armen Tigranyan, became the highest point of the Alexandrapol national professional music life. The further development of the compositional art in the city took place during the year of soviet culture. At the beginning of 20th century, N. Tigranyan, Gh. Ghazaryan, A. Ter-Ghevondyan, A. Ayvazyan, M. Mazmanyan, E. Saharuni and A. Shishyan composed their works here. In 1924 N. Tigranyan and D. Ghazaryan, a composer of Shushi, opened a music studio with join efforts. Starting from 1934, the music collage named after Q. Kara-Murza becomes a center for creating professional musicians in Leninakan. The city has eight music schools now. With this branch initiation great celebration of classical unique music “Renescence” festival is taking place in the city, which supports the flourishing of the city’s cultural life. It worth mentioning the April 19th, 2013, the 5th interenational “Renescence” competition-festival was organized during the framework of “Gyumri CIS cultural capital” project. Over 30 countires with 2400 musician-performers participated in this festival.